If you've ever tried to photograph the moon you may have run into some common problems. You may be asking yourself "Why is the moon so small in my photos? ", or "Why is the moon just a little white blob?". To photograph the moon with all of it's detail you'll need a long lens, a camera and ideally a tripod. With the right settings you can photograph the moon like a pro. Use a tripod and a long lens. Zoom all the way in and focus on infinity. Use a remote or 10 second timer to photograph the moon. What equipment do I need for Moon photography? A DSLR or Bridge camera with manual exposure. A long lens - 300mm minimum, 500mm or more preferred. A camera remote, or self-timer mode. Use a DSLR camera that has manual exposure (M mode). Using manual mode will allow you to fine tune the photograph and prevent your camera from over-exposing the moon. A camera with at least 16 megapixels is the minimum recommendation, and if you have 24 megapixels or more you'll be able to capture an amazing amount of detail. How can I fill the picture with the Moon? The moon is over 250,000 miles away and is small enough in the sky to cover with your thumb nail at arms length. So to capture a detailed photo you'll need a long lens. The longer the better. With such a long lens, it's very unlikely you'll be able to get a hand-held sharp photo, so a sturdy tripod is a must. Check the weight of your camera and lens combined and ensure your tripod is rated to handle at least that weight. The moon. Photographed with a 400 mm lens on a Nikon D800. When can I see the Moon? Know the moon phases and where the Moon will be visible. There are some great websites and apps that can provide this information. moonconnection.com is a great website that shows the phases of the moon by date. Another great website and app is The Photographers Ephemeris - this shows the location and elevation of the sun and moon at any time and place, on an interactive map. When is the Blood Moon or lunar eclipse? Sometimes there is a special event called a lunar eclipse, otherwise known as a blood moon, so named for the deep red colour of the moon as the earth casts it's shadow. Lunar eclipses occur two to four times each year, with total lunar eclipses occurring less frequently. 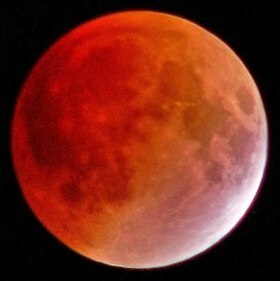 The next total lunar eclipse visible from the UK will be 21st January 2019. Lunar eclipses or 'blood moons' occur only 2 to 4 times per year. With total lunar eclipses even more rare. Even a thin layer of cloud can make it impossible to photograph the moon with detail, so it's important to choose a clear night. Clear nights can be cold, and the colder the air the clearer the sky is likely to be. Warm air contains moisture, and creates a haze which will lower the sharpness and contrast in your photograph. Charge your camera battery, find your tripod head, clean your lens, and have a blank memory card in your camera. Where can I get the best photos of the Moon? Bright lights and pollution can cause glare and haze on your photograph, hiding the subtle details on the lunar surface and causing low contrast. Choose a dark location far away from the bright lights of towns and cities. Remember to stay safe - ensure someone knows where you are, and carry a light. How do I set up my equipment to photograph the Moon? Mount the camera on the tripod with your long lens attached. Centre the moon in your viewfinder, and zoom all the way in. You may have to adjust the tripod occasionally as the moon is slowly tracking across the sky. How do I focus my camera on Infinity? First set your lens to manual focus, then set the focus to infinity by turning the focus ring until the mark is at the infinity symbol. You will then need to finely adjust your focus. Most modern DSLR cameras have a feature called 'live view' - the ability to see the live image on the back screen of the camera. By using live view, and zooming all the way in on the image, you'll be able to see the edges of the moon and it's mountains. Move your focus point to one of these prominent features, then manually adjust until you have the sharpest image possible and leave it there. A steady hand will be required as very small movements can make the live-view image shake wildly. What settings should I use and what is the Looney 11 rule? Similar to daylight photography's sunny 16 rule, the loony 11 rule can be used to set the exposure for photographing the lunar surface. The loony 11 rule states that at an aperture of f/11, set your shutter speed to [the reciprocal] of the ISO setting. Setting your aperture to f/11, and your ISO to 100, you would need a shutter speed of 1/125. An ISO of 200 with an aperture of f/11 will require a shutter speed on 1/250. If this is too slow to stop the blur from the moons movement with very long focal lengths you can raise your ISO to 400, and your shutter speed to 1/500. How do I take the photograph without any camera shake? If you have a remote for your camera, it's time to use it. If not, then activate the timer on your camera, about 10 seconds should be ok. This will allow time for the camera to stop moving after the shutter is pressed. You'll notice when focusing your image that the slightest touch on your camera will cause the image to wobble and blur. Using a remote, or timer solves this problem. Cropping the photograph too far can cause soft results. How do I post process my Moon photo? Usually very little editing is required, but unless you used a telescope you'll notice that your moon still looks quite small on your photo. Using an editing application such as Photoshop, you should be able to crop your moon photo to fill more of the frame. You can then adjust the contrast and sharpness slightly to bring out that amazing lunar detail. Popular image editing software includes Adobe Photoshop & Lightroom, or you could use Gimp (free) to edit your photo or any of many other capable photo editing applications. Take care not to crop too much though as you'll lose quality. You may also want to use your application to slightly sharpen the image after the crop. I'd love to see your moon and astro photography. Leave a comment or your photo below, and if you liked this tutorial use the buttons below to share.